To find Australian and New Zealander business contacts, you need our comprehensive Australia and New Zealand email database. 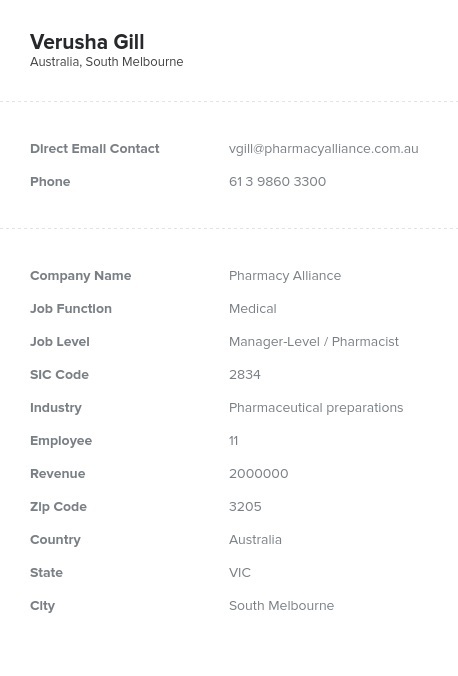 Our business database of valuable ANZ sales leads includes email addresses, phone numbers, company information, and much more for key players you need to talk to. From Perth, AU, to Christchurch, NZ, there are a plethora of businesses that could use your products. But how will you find them without getting mired in a pile of bad information? The answer is simple: Buy this Australia and New Zealand mailing list. In it, you'll find the names of influential people at businesses across these two countries who have the authority to make purchases on behalf of their employers. We've also included information about their companies as well as their direct phone numbers, email addresses, postal addresses, and even fax numbers. And since we double-authenticate each targeted email list that we sell, you can be sure that the information you'll receive will be current and correct. Looking for something a bit narrower in scope than this pre-built Australia and New Zealand email list? Not to worry: Just try out our list-builder option to create a B2B email list that's customized to suit your marketing campaign. You can filter contacts by things like job title, company size, or location, so whether you're looking to talk to welders in Wellington or senior sales managers in Sydney, you can find them here. Get the sales leads you need and save time with Bookyourdata.com!